It has been a day of things in trees. At long last we found the elusive leopard. There was another one which was lurking in some rocks and was not coming out. 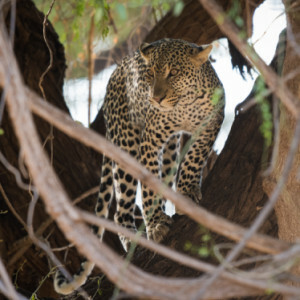 We circled more bushes near another camp and finally found the leopard. 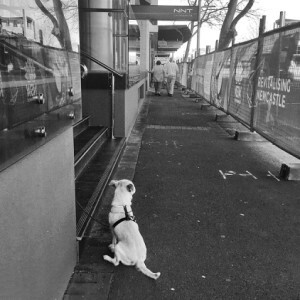 He is in the extra. He turned around and then lay on the branch with all four legs dangling. Just like a domestic cat I used to have. I always thought Miss Tish was very leopard like in her behaviour. 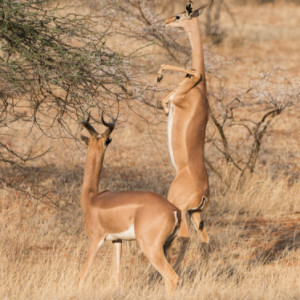 The other thing in the tree in the extra is the gerenuk. They have long elegant necks and tiny heads and can stand on their back legs reaching for the leaves on the acacias. All too soon we had to pack up and leave Samburu and drive the long hot dusty road back to Nairobi. 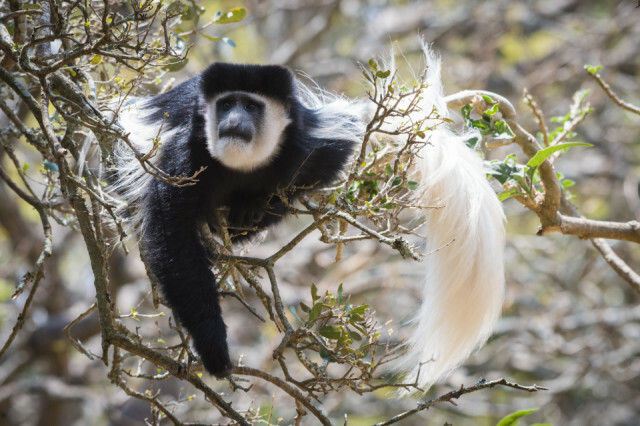 This was a colobus monkey. There was quite a large group hanging around where we had lunch. I suspect that they are encouraged to come so that people who come for lunch at the restaurant can feed them (for a small fee). Back to civilisation in Nairobi. Reliable internet, power all night for charging but oh my, the traffic. It rates third to Lima and then Cairo. 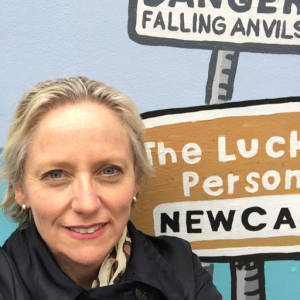 I am now in Joburg waiting for my flight so will be off the air again until I get back to Newie and I might stay in Sydney until Sunday. Thanks so much for all the kind comments and gifts on the safari pics. I have enjoyed your comments and having you along for the ride. 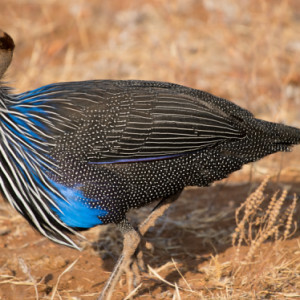 Oh and the last extra is a vulturine guinea fowl. It looks like a monk in the head but it's feathers are just stunning. Now this bird certainly doesn't get in the trees.